Rdio has announced today its plans to offer Canadians free music streaming for up to six months for new users, with no credit card required for the trial. Users will be able to access their library of over 18 million songs without ads to stream over the web. This is a huge step in Rdio being essential to Canada’s evolution in digital music discovery and it’s perfect timing with so many of us cooped up inside in need of a little musical inspiration. Do note the trial is only free for web streaming, whereas Rdio has a $9.99/month paid option for unlimited web, mobile streaming and wireless syncing to listen offline. Users will be able to track how much music they’ll be able to stream via a meter once logged in. The benefits of Rdio is the ability to create and curate playlists with their vast library, which is something we are unable to do with free rival Songza. Let us know if you’re going to check out Rdio–the extensive library makes it great for music lovers and this extended trial looks to be a decent opportunity to give it a try. 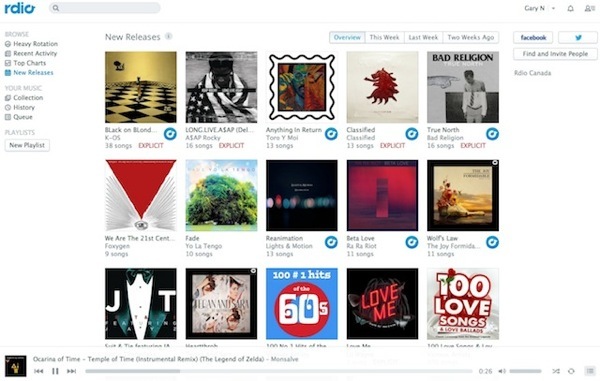 Last November, Rdio announced the 2.0 launch of their redesigned iPhone app. TELUS customers have been able to subscribe to Rdio straight from their accounts since the summer of 2011.